Please note that this bread recipe has been revamped several times, most lately 7/12/16, so you might want to check to see if you have the most updated version in your files. Through the process of making a cookbook and doing tons of cooking and baking in the last year, I’ve learned a few things above alternative baking. And I came up with a hypothesis about why this bread recipe always had holes: it didn’t have enough protein to give it the structure it was lacking because of the fermentation of the flour. So I added more egg whites, made a few other minor changes, and I now have an amazing bread recipe that rises as high as the homemade bread we used to make pre-THM. NO HOLES!! I am super excited. And this version crisps better in the toaster, too! I’m satisfied. I have bread to eat that is kind to my waistline (and is cheap – no sprouted flour required!). And despite the instructions and fermentation time, this bread is actually really easy to make, especially when you’ve done it once or twice and know what comes next. 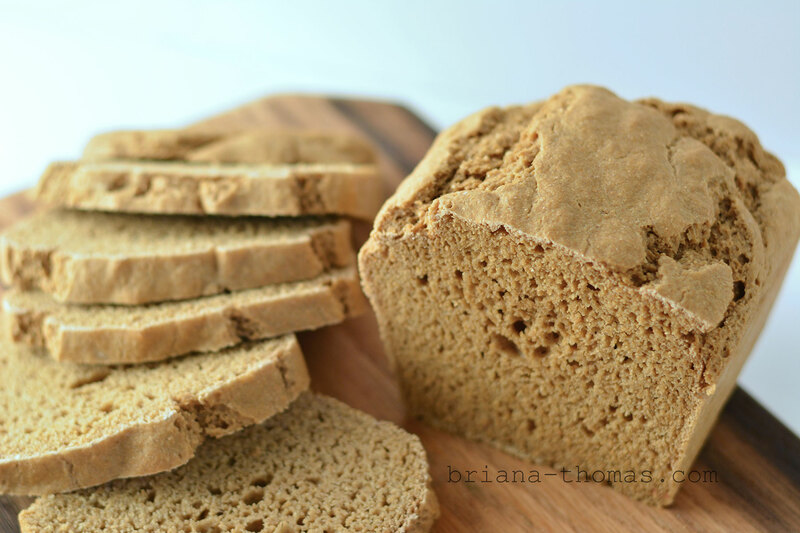 This bread recipe is Trim Healthy Mama approved (you can click here for my quick synopsis of the plan). 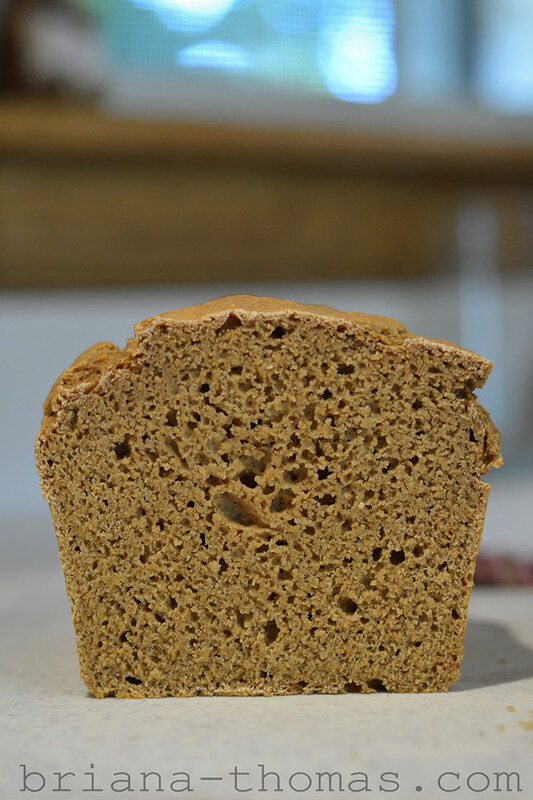 Wheat flour, while a spiker of blood sugar if used straight up, is fine when fermented through prolonged yeast action. The fermentation process breaks down the carbs in the wheat flour to a state that is kinder to your blood sugar. Instead of messing with a sourdough starter, instant yeast makes the job easier. Let it do its work for 7 days in the fridge – easy peasy and no bowls cluttering up your kitchen counter. As for the 7 days – that is the number I have settled on for myself personally as I feel it gives me a full ferment. That is the number I have tested this recipe with. If you don’t feel 7 days is necessary, that is up to you. Some sources say that as little as 3 days is sufficient. I want to err on the side of safety this time, though, so 7 is my number. This bread dough is a result of much research and experimentation and is a delicate balance of ingredients. Please note that this bread recipe has been revamped several times, most lately7/12/16, so you might want to check to see if you have the most updated version in your files. You can pin this recipe from my Breads and Muffins board here. (For the starter) In a plastic bowl, combine the flour, yeast, and warm water. Knead the ingredients together with your hands. The dough will be fairly stiff, but your object is to just get all the flour wet with the yeast water. Set the lid on the bowl but do not seal; let it sit out for two hours at least, and more doesn't hurt. Cover your dough (I just use a Tupperware bowl with lid, and yes, I seal the lid when refrigerating) and refrigerate for 7 days. The day that you want to make your bread, get your fermented dough out at least 4 hours in advance, preferably more. I usually get mine out early in the morning and make bread in the afternoon. This allows the dough to warm to room temperature. After your dough is room temperature, you are ready to make your bread. First, add the oats and water (please note that this is not the normal oat:water ratio for oatmeal) to a nonstick saucepan, cover, and cook until soft. Add the egg whites and knead the dough in the mixer until everything is completely mixed. Divide the dough among three greased bread pans (I just spray my bread pans with a good coat of cooking spray). Use a wet hand to pat the tops of the loaves smooth. Bake on the middle oven rack at 325 degrees F (I use metal pans) for 50 minutes. The first time you make the bread, you might want to cut a loaf through right away and check it to make sure it's done. If it's gummy inside, return it to the oven in 5 minute intervals until you're satisfied. Turn the bread out onto wire cooling racks and let cool *completely* before cutting so your bread will not crumble. For best results, divide the bread into portions that you will be able to eat within 5 days. Keep some in the refrigerator to eat on and store the rest in the freezer, thawing more as needed. The bread has no added fat, so it won't last as long as some breads you may have made before. Yields 3 loaves. Serving size: 2 slices (I cut my loaves into 14 slices each). *You can use standard yeast for the cold fermentation portion of this recipe, but I recommend using instant yeast when making the actual bread dough. The bread relies on baking soda as well as yeast for its rising capabilities (because cold fermentation eats up most of the sugars in the flour), so it isn't given a rising time. Therefore, instant yeast is best because it works quickly. **Honey is usually frowned upon for weight loss on the THM plan, but this is a small amount spread out over many servings and the yeast eats up some of the sugars. This recipe was last updated on July 12th, 2016. « For the First Time in Forever: a Blog Facelift! What size of bread pan do you use, please? Just standard loaf pans. I’m not sure of the exact dimensions but they’re generally between 8″x4″x2.5″ and 9″x5″x2.5″. 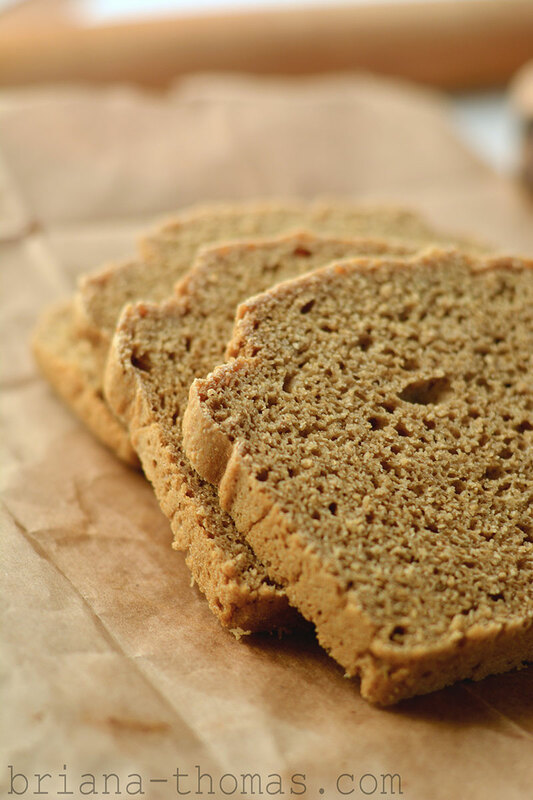 What brand of Whole Wheat flour do you use? Thank you so much for the Homemade Bread Recipe and for all the other recipes you share with us. A BIG THANK YOU for making it affordable. Thank you for stopping by, Terry! I’m glad you enjoy the recipes! What is the purpose of the oats in this recipe? And could it be made with all-purpose flour? There are so many fermented bread recipes out there, and this one has considerably more steps than others. Can you help me understand the health advantages? Will the addition of Greek yogurt give it a sourdough flavor? Also, found out too late that my bowl is NOT big enough for all of this dough… my lid was popping off while rising on the counter. Should I smash it down in the fridge, or use plastic wrap? I have tested this recipe many, many times and this combination of ingredients (oats, Greek yogurt, egg whites, etc.) and process gave me a more realistic bread texture than other fermented breads I had tried, while still staying within Trim Healthy Mama guidelines and not requiring sprouted flour. 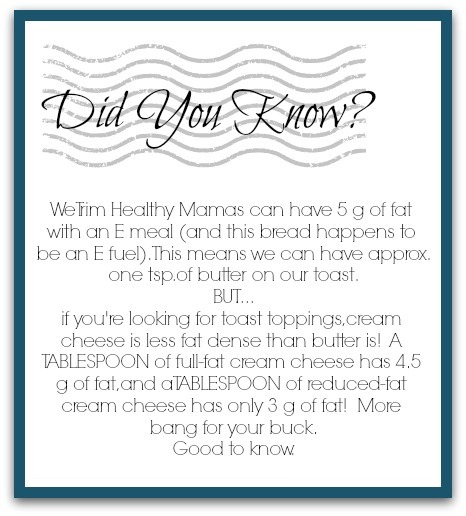 🙂 Using all-purpose flour would not be within Trim Healthy Mama guidelines, but if you don’t follow that plan you’re welcome to try using it. Please feel free to use another, more simple bread recipe if this one seems too complicated! Once your dough rises and settles down again, maybe your lid will fit. If not, cover it tightly with plastic wrap. Can this be fermented, in a glass bowl? I know it can’t be metal bowl. My plastic bowl is huge and would take up a huge amount of frig space for the the 7 days. Would you advise against using rye (I have a ton of berries), instead of wheat grain? I don’t have all that much experience with rye, but when I’ve used it (in other recipes) it hasn’t really acted like wheat flour for me so I’m guessing you’d get a gummier, heavier result if using it in this recipe. You’re welcome to try, though! Thank you so much, Linda! I hope you get lots of good use out of it! I have a question–do you have to make use up all the starter after the 7 days? Or can you use half & then the other half a week later? Just curious. Thanks. Thank you for all the recipes you have shared over the years? Do you still use this recipe as is? Or have you tweaked it at all? Thank you! I want to make this bread for my son, who has digestion troubles, and has to stay strictly away from dairy, even yogourt. What will happen if I leave it out? Is it just for flavor or does it have a purpose? It adds moisture. 🙂 Maybe try substituting with unsweetened applesauce? I had a question about the fermenting process. How do you decide when the sugar seems sufficiently eaten up? Does it smell sour? I am attempting to cold ferment 2 cups ww flour in 4 cups of warm water with 1 tsp yeast. It is the second day and already the hooch (alcohol) has separated and it smells very sour! (after it’s fermented enough I am going to add ground oat flour and make bread.) Just wondering how to tell when it is fermented enough and there doesn’t seem to be many THM related articles to this process online! Thanks for your input! In Pearl and Serene’s sourdough recipe in the original THM book, they recommend a 7 hour ferment after the last addition of flour to a sourdough type bread recipe (which is slightly different from the cold fermentation concept). Your oat flour doesn’t need to be fermented to fit into THM guidelines, so if you’re keeping your “starter” on the counter, I think you’d be fine if it’s fermented for 7 hours and then you add the oat flour. I’m sorry – I really don’t know much about the whole process other than what’s in this post. I hope to experiment more with sourdough recipes in the future! Can we use whole eggs instead of just the whites? I don’t like to seperate them because I never know what to do with the yolk and we don’t mind crossovers! I haven’t tried that, but I don’t see why not if you don’t mind crossovers! If anything, the texture would be a little bit heavier. I haven’t tried that, but you’re welcome to do that! If you try, I’d love to hear how it turns out! I am interested in trying your bread recipe- I love Gwen’s for pizza crust but I want to find something that stands up in a loaf better. 🙂 The recipe calls for a 7-day ferment… I want to go ahead and get that process started but my family and I are going out of town and I will not be able to bake the bread for 2 weeks. How would a longer fermentation affect this recipe? Thanks! I thoroughly enjoy and appreciate all that you do! Hi Briana, this looks delicious! Just wanted to confirm that the loaf didn’t need a second proofing? I am usually an avid sourdough baker and bake with spelt and kamut sourdough. I was wondering if I could use my own sourdough starter in place of your starter dough ? Is it stiff like biscuit dough or more like a pancake batter? Looks like wonderful stuff ! Hi Genet! My “starter” is pretty stiff. I probably wouldn’t try using your sourdough starter; this recipe is a fine balance of different ingredients and specifically formulated for the cold fermentation process. I know there are a lot of good sourdough recipes out there though! It would probably be best to use a recipe that’s formulated for a sourdough starter like yours than trying to tweak this one. Instead of cooking the oatmeal the day of bread making, would I be able to just use ovenight soaked oats? Does it HAVE to be cooked? The oats have more of a glue-like property when cooked, so I don’t recommend omitting the cooking part. I think it would be much easier to do it all at once instead of dividing everything by three, but if that’s what you prefer, go for it! Do you think this bread would work with a normal sourdough starter? (I keep one going on my counter) and if so, about how many cups would you need instead of the 10+ cups of flour and water used in your 7day starter? Have you ever tried, or found a good (not difficult) recipe for GF sourdough bread? No, I’m afraid that’s not something I’ve ever looked into. Is it possible to make gluten-free sourdough bread? I would’ve thought that the natural yeast would need a glutinous flour to feed off of. That’s some awesome ingenuity! So glad it worked for you! It worked because this is a very forgivable bread dough. I have made some “official” European bread before that was delicious (definitely not THM!) but had to be handled very delicately. Thank goodness, this really doesn’t. How large a container should I use to store the initial sourdough in the fridge. Does it rise in fridge? I use a huge Tupperware Fix and Mix bowl (32 cups, I think? ), but you wouldn’t need something that big. It doesn’t rise much in the fridge after rising on the counter for a few hours. Will it continue to rise in the fridge? I put it in my largest Tupperware but it’s all the way up to the lid at the time of refrigeration. When you say add the flour to the water/yeast mixture, do you mean the 2c oat flour listed toward the end of the ingredients list? I am so excited to try this bread. It has been in the fridge for five days and I couldn’t stand to wait any longer. I just divided the dough into pans and it was so moist I could pour it into the pans. Is it supposed to be that moist or did I do something wrong? Nope – it’s supposed to be that moist. 🙂 Since the rising action comes from the baking powder (since there are no sugars for the yeast to feed on), the dough has to be runny in order for it to rise properly. Thanks for making it! I hope it turns out well for you. 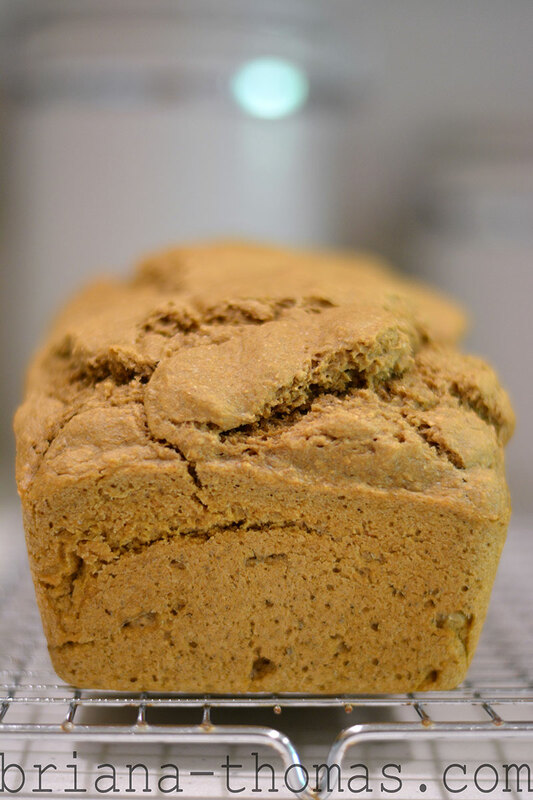 Do you have a recipe using purchased sprouted flour? Would I follow these same directions using it, but just moving past the ‘starter’ steps? Thanks in advance; I love your recipes. No I don’t, Cheryl, but I know there are some good ones on Pinterest! How long can this bread stay in the fridge before baking? We do it for 7 days. It probably wouldn’t hurt to stay in the fridge longer than that, but it might get more sour tasting. Thank you! I am looking forward to trying this bread! I have been off plan for a year… pregnant with twins now BF them. I know this way of eating is so much better for all of us. My girls love bread and I have a grinder and Bosch. This will be so perfect and save us $s! BTW I loved your site the last time I was doing THM and seems you have been hard at work the last year! Can’t wait to try all your recipes! I got your recipe from a sweet friend after she had gave me a loaf of hers. I was eating Ezekiel bread but it wasn’t quite hitting the spot. This recipe tastes AWESOME. Thank your for sharing. I almost feel guilty for enjoying toast again on THM 😉 I made mine this last week, I hand kneaded it as I don’t have a mixer, so the oats weren’t super broken down. But hey the bread tastes great anyway. Thanks again! Can regular yeast be used instead of instant? I haven’t worked with regular yeast much, but I think that in this case it would be OK. Just make sure that the starter rises before refrigeration (it won’t rise a lot because it’s not very runny, but you will be able to see at least some yeast action and hear the dough crackling). Hi. Love your recipes. I’m new to bread making and trying to go gluten free and thm to see if it gets rid of my migraines do you have any recipes for gluten free bread but still thm friendly? I have a question. I am new to THM, and I have wondered about my own bread recipe. I don’t call it “fermented” but “soaked.” It is 4 ingredients: water, yeast, salt, gold & white flour. Anyway, you make this bread dough and let it sit in your fridge, baking only what you need as you go. I always let it sit at least 24 hours before I make the first loaf, and I might make 1 loaf per week (it makes 3 loaves), so the dough could sit for up to 2 weeks before I use it all. I understand that this “soaking” makes the bread more easily digestible, not to mention that it is very easy to make and quite convenient! Is this sufficiently soaked/fermented to be appropriate for THM? If you know, I would sure appreciate a reply. I’m open to trying new recipes, but my own recipe works well for my whole family. Thanks! Thank you, Briana, for the additional resource! And thank you for your quick reply! Hi! I was wondering if there was a bread recipe using store bought sprouted flour? Also which type of store bought yeast? Instant quick rise or original? Hi Juliet, I know there are some recipes out there using sprouted flour. Check Pinterest. 🙂 I use instant yeast in this recipe. I’ve never tried it without the egg whites, but I’m guessing that it wouldn’t work very well. I don’t know though; it’s worth a shot. I’m sorry, but I don’t know much about egg-free substitutes that would work as binders. I tried it using gelatin as a substitute (you can google gelatin egg to find out how to do it). It did fine for me. Do you have to add the yeast with the flour/water mixture for it to ferment properly or does it ‘do it’s thing’ without the yeast.. cuz i have found it rises better if you wait to add all the yeast until you mix it up just before baking? Thanks so much for responding to my question! I LOVE your blog + recipes! Keep up the awesome work! I especially like that you actually reply to people’s questions… so many bloggers post their stuff and then leave you hanging with your questions.. grr. I love trying your recipes, they are A+! My starter was very thick and heavy…I just looked at it (Day 2), it’s hard on top side. Dough on underside was a but softer. Did I not add enough water?? It’s not stiff like mashed potatoes, it’s hard like a rock…?! Help. I was under the impression that yeast from the store was not good for you, and that wild yeast from the air is the only way to go. I’m still very new to THM and still have so much to learn. (Sorry if my question is too ignorant). im excited about making and trying this bread. Question: after you put the bread in pans, do you just bake it right away? I know the recipe doesn’t say to let it rise like normal bread needs too. Yes, you bake it right away. The primary rising agent in the bread is baking powder, which needs to be baked immediately for full effect. Hi there, Briana. I just made this today and it turned out wonderfully. I haven’t made much bread since started THM and it was fun to have pretty loaves cooling on my counter, again. I sliced off two still-warm slices and made a tasty turkey sandwich for an E lunch. Thanks for doing all of the hard work in the kitchen and for sharing your findings with the rest of us. IT WAS A HIT!! Thank you for putting in the time and effort to make it wonderful bread. Awesome! Thanks for letting me know how it turned out. I can not wait to sink my teeth in to this. I made one reg loaf and one the cinn cran. im taking it to a THM gathering where about a doz THM mommy are coming together to build each other. this is the first time any of us will have tried this recipe. When you have the bread in the pans do you let it rise any before putting it in the oven to bake? No, there is no rising time before putting it into the oven. I hope you enjoy it! Not a lot because there’s not a lot of liquid to enable it to rise. It will puff up a little so you know the yeast is working, but no, it doesn’t rise very high. It will smell “sourdoughy,” but if you left it for more than 7 days it could very well have a stronger flavor that it’s supposed to. So to answer your question, no, it’s probably not ruined, but it could be stronger-tasting than it’s supposed to be. You might as well make it and try it, at least, if you have the dough already. Do you know how much truvia I could use instead of the 2 doonks of THM stevia? I don’t have any! I can’t wait to make this later today!!! So, for THM you said this is an E bread….do you know the carb count per slice? Yes, this is an E bread. Because of the cold-ferment time that breaks down some of the carbs, I have no idea how one would go about finding the nutritional info on this bread. However, that’s the beauty of THM: the numbers aren’t a big deal. Keep your fuels separated and stick within the two-slice serving size and you should be good. Briana, you’re the best! 🙂 I love your website, especially the recipes! I haven’t made the bread yet, but plan to in the near future. This recipe looks fantastic and I really want to try it! But I don’t have a stand mixer, just the hand held type. I’m familiar with bread making (I made all the bread for my family when I was in high school, fresh ground flour, for 8 people). I’m just wondering how practical it was for me to attempt this without much equipment? I would definitely keep an eye out at thrift stores. I’ve seen several stand mixers there. Ok, so because I’m stubborn, and when someone tells me something can’t or shouldn’t be done, I do it anyway. I tried your recipe without any of the heavy duty equipment, and it worked! It took me about an hour to get it mixed and into the pans, but I think that’s reasonable. It was a little more work and required some ingenuity, but it can be done. To mix the starter and oatmeal, I took one fist size ball at a time and cut it into 1 inch pieces and placed them in a food processor (mine is a very small ninja) with one spoonful of oatmeal. I did this with each ball until I had mixed some oatmeal with each one. All the dough went back into the bowl. In another bowl I mixed all the other ingredients. Then I poured it over the dough. Then I used a potato masher to mix it up. Once it became a goupy mess I got out my small hand mixer (a $15 one) and mixed for 3-5 minutes. It was pretty obvious when it was done, it just came together all of a sudden. Then I baked as you recommend. The 2 loaves came out big and beautiful! Hi Briana, love your site. Your recipes are wonderful. You are truely gifted. Thanks for sharing that. I use sprouted spelt for all our flour. Which I sprout dehydrate and mill. Will the sprouted spelt work for this or should I use just milled unsprouted spelt? I know spelt acts different than wheat. I have no idea; I’ve never used spelt flour. If you decide to experiment with it, let me know how it turns out. 🙂 Since you’ve already sprouted your flour, I would just use it in a regular bread recipe. You’ve already done the hard work-no need to complicate things more. I just made this recipe for those who don’t have sprouted flours. AWESOME!!! I’m so glad to hear it. I’m baking another batch myself today…trying a few different things to try to improve it. It seems a never-ending process but I’m *determined* to get a good-looking piece of bread. Eventually. In Step 5, combining the molasses, water and yeast, is this additional yeast? How much? Your bread needed about 5 more minutes in the oven…hence the hole where the slightly undercooked dough fell. I have done it with other bread recipes when I got slightly ahead if myself and grabbed it out a few minutes early when I had made it enough to know better lol. Awesome recipe though. Can you tell me what size bread pans you use for this recipe? I want to make sure I use the right ones. Thanks! 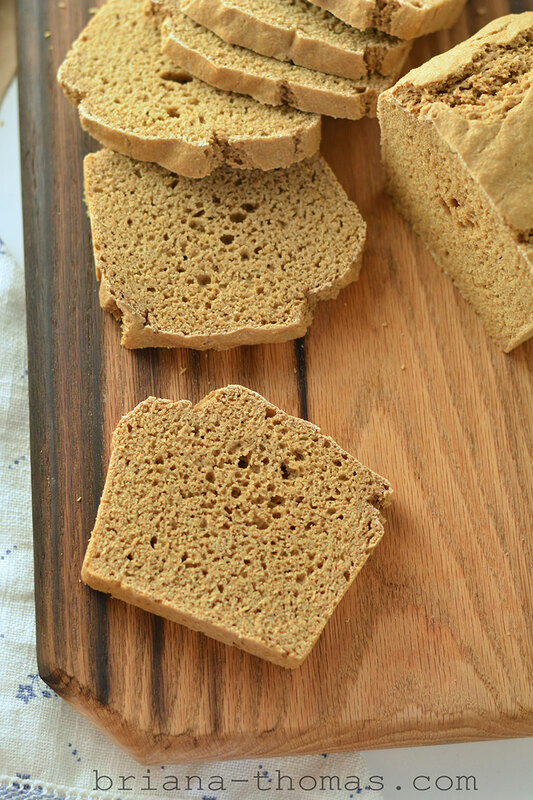 This looks amazing and I haven’t used my whole wheat flour in so long, I can’t wait!! Kelly!! *hug* Thanks so much! Looking forward to hearing from you. A lot of credit goes to you for inspiring me to make the switch from Blogger to WordPress…and let me tell you, I’m SO glad I waited no longer. What do you mean by instant yeast? Are you speaking of the regular yeast in the star or the one that is rapid rise or neither? Thank you. Last I checked, yes I am only 18. 🙂 I love what I do; thanks for following. For some reason only part of my post showed up?? Anyway. It was delicious and worth the wait. But it was very dense and a little crumbly. Is that expected or did I do something wrong? Hmm, that’s strange that your post didn’t show up. But yes, this bread is fairly dense because it’s fermented. Fermented flour is dense, end of story, for better or for worse. As far as crumbliness goes, it will probably be a little more crumbly than regular bread, but shouldn’t be too bad. Did you do anything different from the recipe? How many egg whites did you use? Did you wait to slice the bread until it was completely cool?